Going back to school doesn’t have to be a stressful experience. It’s something that happens year after year, yet rarely becomes particularly monotonous. More often than not, the best way to make sure you have everything required for these scenarios is to have a checklist for it. In this case, a back to school checklist is extremely useful to make sure that everything that needs to be done, gets done. The purpose of this template is to make your transition back to school go as well as possible. Transitioning back to school can be particularly stressful because of how much goes into it, which is why the goal of this back to school checklist is to be custom tailored to you and extremely easy to use. No matter how unique your checklist may be, this template can adapt to anybody’s needs. Because this back to school checklist is made to be used by everyone, it also offers a quick, effective, and easy to use format. On top of its ease of use and professional customization, it’s free to use by everyone. Look through the list provided and check off the things you have done and the items you have bought by clicking the white boxes. To add any items to the list simply click on the space in the appropriate column and begin typing. Each box comes with its on box to check. To remove any items from the list simply click on the item and hit delete. This also works if you select an entire row. Make sure to add any items unique to you and your needs to your list. The list already comes with plenty of items on it already, but is capable of being changed however you need it. Keep it updated. 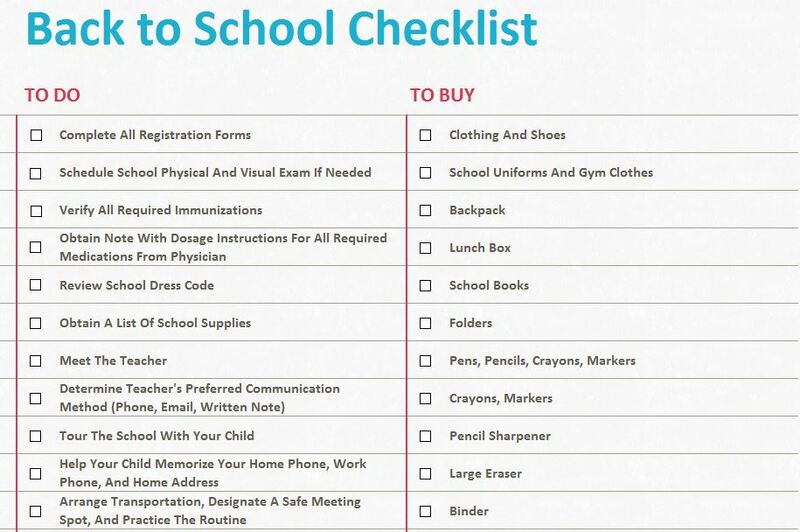 The most effective way to use the back to school checklist is by making sure it’s current. Use the checkboxes! A back to school checklist is the most efficient way of keeping track of any duties or needed items for your own unique back to school experience.